Home to Oktoberfest, Munich is the best place to explore traditional, Alpine Germany. It’s also a great jumping off point for outdoors activities in the Alps mountains and surrounding lakes. And did we mention it’s a fantastic place to surf? Hundreds of surfers gather on the Eisbach, a small stream of the Isar River located in Munich’s largest public park. The surfers jump in the chilly water to ride the 1 meter high (by 12 meters across) wave, made with the help of strategically placed rocks. Check out the Travel Honey MUNICH PHOTO GALLERY. Cortina Hotel ($$$$) Austere chic with lots of beige and white tones. Hip crowd in the lobby. Hotel Munich Palace ($$$) Low key, classic and luxurious digs. Use their bikes to get around town. Pension Am Jakobsplatz ($$) Amazing location, fabulous breakfast and unbeatable price point. Minimalist and well-lit. 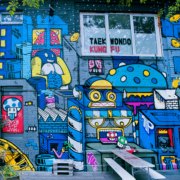 WHERE TO EAT IN MUNICH? China Moon Roof Terrace ($$$) Amazing views of the city from next by the Mandarin Oriental’s rooftop pool. Don’t miss the watermelon starter. Hofbrauhaus ($$) Regal beer hall with classic German food. Prost! Viktualienmarkt ($) Farmers market with fresh veggies, snacks, meats, cheese, anything you could possibly want. WHERE TO GO AT NIGHT IN MUNICH? Bar Gabanyi ($$) Best cocktails in Munich. Cosy with secret garden. Jazzbar Volger ($$) Mellow jazz tunes and tasty drinks. Zephyr Bar ($$) Hip, creative cocktails and drinks. BEST INSTAGRAM ACCOUNTS FOR MUNICH? Fly into Munich’s MUC airport, the second largest in the country, after Frankfurt. If you’re coming the U.S., Munich is a nine hour direct flight from NYC and DC. It also possible to fly into Frankfurt airport and drive 4 hours south to Munich. There are also regular, well-priced flights to Munich from most large European capitals via EasyJet, Norwegian Air, Lufthansa and British Airways. Walking is your best bet. Otherwise, jump on a bike or taxi. If you have the time, then get to know Munich’s super efficient underground, the U Bahn or suburban trains, S Bahn. 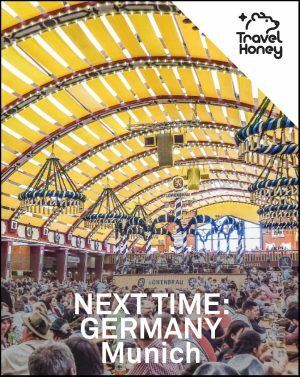 Check out this Travel Honey itinerary and get the inside scoop on Munich’s amazing activities – like Oktoberfest!